You might not recognize her by name, but chances are you have heard her music. 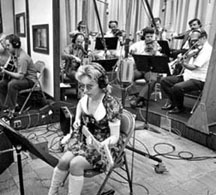 Carol Kaye, session bassist extraordinaire, with an impressive resume to her credit. She holds the record of being the most recorded bassist, male or female. "It was our job to help everyone get hit records. Talking about recording 16-20 songs every day, I did over 10,000 dates, that's about 40,000 songs." A partial list of Carol's electric bass session work reads like a who's who of 60's pop: The Beach Boys, Simon & Garfunkel, the Righteous Brothers, Ike and Tina Turner, Nancy Sinatra, the Monkees, the Crystals, Paul Revere and the Raiders, Mary Wells, Gary Lewis and the Playboys, Leslie Gore, Elvis Presley, The Hondels, The Supremes and the Grass Roots. Her electric guitar session work includes: Ritchie Valens, the Righteous Brothers, Sonny & Cher and Frank Zappa. When I first approached Carol for an interview regarding her work in pop music, she seemed to downplay her role in pop history. "I'm really a jazz musician, most of the recording musicians on those rock hits of the late 50's, 60's and 70's were fine jazz musicians, very few 'rockers' on rock records." E.C. : Did "Good Vibrations" take 6 months to record, or 6 weeks? There seems to be some dispute here. Carol: I'd say more like a couple of months, 12 dates in my log for that particular tune, over a period of a couple of months. E.C. : I know the Byrds used studio musicians when they recorded "Mr. Tamborine Man". Did you play on any sessions for the Byrds? Or with Van Dyke Parks (his solo work)? Carol: No, not the Byrds, but yes tons of Van Dyke Parks sessions last of 60s,and early 70s. A nice man to work for, somewhat boring music tho' I thought, but there again, we weren't there to "judge", we were there to help everyone get a hit record. E.C. : I was surprised to find that you did sessions with Frank Zappa. What was he like as a producer? Especially compared to Brian Wilson and Phil Spector? Carol: Frank used additional studio musicians with his basic rhythm section. He hired me for his first 2 albums (it was customary for all rocker people like Frank to use our bunch of studio musicians, but he was only one of a very few who also used some of their own musicians too, probably 1 of 2 or 3 groups total). He was a super pro, appreciated good musicianship and was terrific to work for. He could write great, was a fine composer, schooled etc., others like Phil Spector and Brian were not schooled. Phil was different, he was a showman kind of, very fine in his contributions of sounds, recordings, the overall ways of producing - he came up with some timeless innovations. He was good to us, respected the jazz musicians especially. Brian was a different kind of producer, more into the musical sounds, some of the experimental sounds of the studio, but more into the music. Frank was more into the band-sense I think with composition and producing, was just as nice as Brian, but more intense somehow - I don't think he was into drugs at all. On the dates recording the 2nd album for Zappa, I saw a copy of his lyrics and told him in a nice way that I just couldn't play on this stuff, I was a mother and felt badly about the lyrics....he totally understood, and we remained in touch from time to time...I felt very badly to see him go, he was a wonderful human being, loved his family, was a total good musician/composer, a very straight guy. E.C. : I've recently become a fan and admirer of Brian Wilson's mid 60's work, especially with the Pet Sounds Sessions Box set. Since you also played on the Smile sessions, do you think we'll ever see a Smile Sessions Box set? From what I've heard from those sessions (both commercial releases and bootlegs), the songs are truly amazing! Carol: I don't think Brian wants to ever complete that album for some reason, Idoubt it. E.C. : How complete was Smile in your opinion? Everyone involved in the Smile project has an opinion. Some say it was close to completion and some say it had a ways to go. Since you were there, what do you think? Carol: I really have little idea of how much work there was to do. Probably a lot, with connecting the various bits and pieces....not being a commercial producer, I don't know, it's hard to read Brian's creative mind. If it was back then, I'd say not as much work as now. You're fresher after having done that work, and over 30 years later, your mind is in a different space than back then. Wish it could have been finished, it was his greatest work. E.C. : Do you think that the material for Smile was as creative/ground breaking for pop as Pet Sounds was? Do you think that the album would have made a big splash? Carol: I think it was better. And probably wouldn't have sold as great back then as a little later. People weren't ready for Brian's growth, but later in the 70s, yes would've sold big. E.C. : Comparing the Pet Sounds/Good Vibrations/Smile sessions, were there any perceivable difference in the way Brian worked? We've all head all the stories about drugs, etc. But, I imagined that Brian was like the Beatles, in that he NEVER did that stuff in the confines of the studio. The work there was too important. I know the other band members thought Brian was getting too "far out" with his new music. I'm just trying to see if you noticed any pressure from Brian with his more experimental music? Carol: No, there was no difference. It was apparent that he was growing fastmusically, and we were all happy for him, were excited to see what was going to "come out of the kid next". He didn't seem like he was under any kind of pressure, but did say something about "competing with the Beatles" in a nice sort of way. No, never saw any drugs w/Brian in the studio at all. He knew none of us used drugs, just wasn't done back in the 60s in the studios. E.C. : How did you feel as, over the years, bits and pieces of the Smile sessions finally came out? For instance, "Cabinessence" in 1969, "Surf's Up" in 1971. Carol: Well I certainly liked what he did to "Heroes And Villains", but stoppedlistening to the radio on commercial music early 70s....I sort of lost track of the Beach Boys, altho' I've always wished Brian Wilson well.....very fond of Brian. Was sorry to hear about the evident "drug-use" but everyone almost was using drugs back then it seemed (not so much our older bunch tho', a few did however). E.C. : After the Smile sessions, the Beach Boys as a group pretty much assumed production roles. And they started (I'm assuming here) playing more of the actual music themselves. When was the last time you worked with the Beach Boys in the 60's? Carol: About 1969 was when I totally decided not to record for the BB's and other groups, took a total hiatus from studio work in 1970 and returned only to concentrate more on the TV and movie soundtracks I had been doing right along and no more rock groups to record for, only select recording dates too. The BB's did do some cuts on their own (after the initial 2-3 dates they did when they first got started), just a few mid-60s w/Brian at his home. I'm sure that they still hired studio musicians tho' to do them too in the 70s....was the custom then (AND NOW!). Carl tried to reach me to record with him in Colorado, but we never connected (about 1981). E.C. : You have done many books and tapes in your teaching series. Haveyou ever thought about writing your memoirs? Carol: I've written over 27 tutorials, most of which have been highly successful. I have a biography book about 1/3 done, trying to get back to finishing it now. Many thanks to Carol Kaye for granting me a personal interview and giving me access to her collection of internet interviews.